It’s not the first time we’ve heard these words, but US scientists say they’ve achieved a breakthrough that brings us “one step closer” to finally achieving the ultimate of clean and endless power: nuclear fusion. That breakthrough came yesterday, when researchers at the National Ignition Facility (NIF) at Lawrence Livermore National Laboratory (LLNL) fired a record-breaking shot of laser energy onto a tiny target containing two different isotopes of hydrogen fuel. That historic, one-megajoule-plus blast lasted just a few billionths of a second but, at its peak, delivered 500 times more power than the entire US uses in any single moment. It also fired out about 30 times more energy than any other group of lasers in the world has before. “Breaking the megajoule barrier brings us one step closer to fusion ignition at the National Ignition Facility, and shows the universe of opportunities made possible by one of the largest scientific and engineering challenges of our time,” said Thomas D’Agostino, administrator of the National Nuclear Security Administration. Nuclear fusion, the reaction that fuels our Sun and the stars, has been a long dreamed-of goal in science and a vision for powering society without fossil fuels or carbon emissions. Unlike the fission reaction of today’s nuclear power plants, fusion energy requires no uranium — just hydrogen, the most common element in the universe. In this week’s successful test, scientists aimed an array of 192 powerful lasers at a small cylinder the size of a pencil eraser. Inside that cylinder was a tiny, spherical target containing the hydrogen isotopes deuterium and tritium. 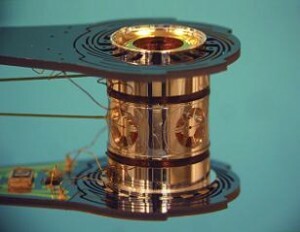 The goal is to use the laser energy to generate x-rays in the cylinder; those x-rays should then compress the hydrogen target to the point it reaches a high enough pressure and temperature (more than 200 million degrees F) to set off a fusion reaction just like that that takes place in the Sun. The National Ignition Facility’s next goal will be to conduct experiments with fuel in a frozen hydrogen layer inside the target. Those tests are set to begin this summer. There is a technique simpler and efficient to surpass the fusion breakeven point, that is using electrostatic acceleration. Ok, there are few things I’d like point out here. Firstly, as Brian pointed out, fusion in itself doesn’t necessarily need deuterium and tritium to be feasible. They just are the most energy efficient and perhaps the easiest to come by. Thirdly, even in current research projects around the world (google JET in Culham, UK, Tore Supra, France, and ITER which is in construction as we speak, there are also several projects in Germany [Wendelstein], in US of A etc) the shielding materials are researched to provide this lithium-to-tritium phase of the feasible fusion power plant cycle. And finally, go and study before posting “IMO”/”I heard my cousin/roommate/step mother-in-law/whatever once speak of it” stuff in the web. If you don’t know, don’t post. There is no more to it. The power beginning used actually is referring to the power delivered by the laser, not the power generated by the fusion reaction. They were simply firing the lasers this time without any fuel in the chamber. @John Busby – Fusion can use a number of different isotopes as fuels. The rule of thumb is that any element lighter than iron releases energy through nuclear fusion and any element heavier than iron releases energy through nuclear fission. My understanding is that the fusion of helium-3 with deuterium is the most promising for nuclear fusion for commercial energy generation. Fusion needs isotopes of hydrogen, deuterium and tritium. Tritium is produced in a fission reactor from lithium, so fusion cannot take over from fission. In any case tritium cannot be made in sufficient quantities to allow a commercial exploitation of fusion, even if were possible. @Greg Mathews – seeing we are discussing power, which is a rate of energy, I interpreted this to mean its peak output was 500 times more than the US’s peak consumption. I agree it is a little confusing. cf. saying the batmobile delivers 500 times more velocity than the average car at any single moment. @Greg Mathews – Power is a rate. so 500 times more energy than we would need over any period of time. The time they achieved this for was 3/1000000000 of a second. Since USA uses 20% of world’s energy we could safely say this could satisfy the energy needs of everyone. So go ahead and leave the lights on. @Greg Mathews – When he says at one moment he isn’t reffering to an interval over time therefore length is irrelavent. Websters defines moment as “a minute portion or point of time”. In the context of this article the author refers to a “point of time”. A point is defined by websters as “a geometric element that has zero dimensions and a location determinable by an ordered set of coordinates” therefore proving that “how long” a moment is, is equivalent to asking how tall 7pm is. The amount of power “the entire US uses in any single moment” is referring to a one dimensional “single” point in time. Power is energy per unit time, so it is instantaneous. In this context, I don’t think there is any issue in the length of a moment. The total delivered energy of the laser blast is unimpressive (1 mega-joule is approximately equal to the chemical energy in a cupcake), but rate at which the energy was delivered, the power, makes it remarkable. you must be a bit slow, a moment is 1.5 minutes. It would have been really helpful to use another word besides moment. How long is a moment?